As good citizens, Jerry Brown our Governor has asked us to cut back on our water usage by 20%. It is a fact that we won’t save that 20% by running the dishwasher, washing machine or showers less…in fact would you or all of your family and friends really want to…especially the showering and clean clothes part? So where is that 20% savings expected to come from, your outdoor and landscape water use of course…that is where the lion’s share of everyone’s water use is anyway. 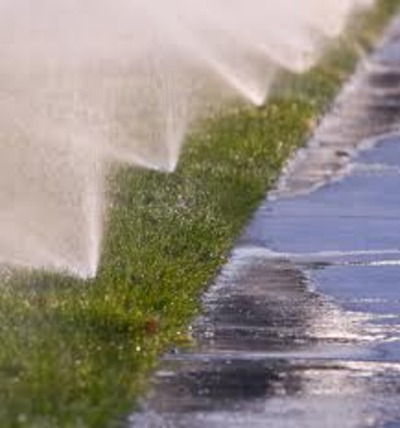 As our Northern California summer heats up and drags on, our lawns are getting browner and our plants are getting droopier…all while the cost of the water we use goes up and our billing rates climb into the higher billing tiers at our water companies! Large shrub areas that are currently being sprayed can easily be converted to drip systems by plugging and eliminating most of the spray head inlets, then tapping into a few existing outlets to add drip hose and emitters…pressure reducers and filters are also needed especially if you are on a well. Groundcover beds and areas can be converted to drip in the same manner as you would the large shrub areas outlined above…however instead of drip hose and emitters add a product called “Netafim” which has the emitters impregnated into the piping. You simply snake the flexible pipe throughout the groundcover beds, and tie it into the existing PVC lines under ground. Set multiple start times on your irrigation controller so that what water you do apply actually sinks into the ground (called a soak cycle) and does not run off onto the sidewalks, driveways and gutters. The ground and your soil is like a sponge, after it gets saturated the additional water just runs off so set “soak cycles.” Get rid of all those old cook book settings you’ve used all these years, and as an example, instead of watering the lawns every day for 10 minutes, water it twice a day for 3 minutes each time or cycle, say 5am and 12 noon…that way all the water gets absorbed and used where it should be in the ground in the root zones. There is also allot of new and efficient irrigation equpment on the market that can easily be added to old systems. “Smart Controllers” rotating spray heads, check valves so that water lines don’t continue to drain when they are turned off…are all a few examples of how to make your existing irrigation system more efficent! Call us if you need an evaluation and more water saving information.